If you fancy a day out over the summer holidays we have listed our ‘Top Ten’ ideas either on the coast or within an hours drive (ish?!). Hopefully, the amazing weather will continue over the holidays but if not, we’ve also included indoor activities too. Unmissable Summer family fun is back at Piglets Adventure Farm from 21st July – 3rd September! 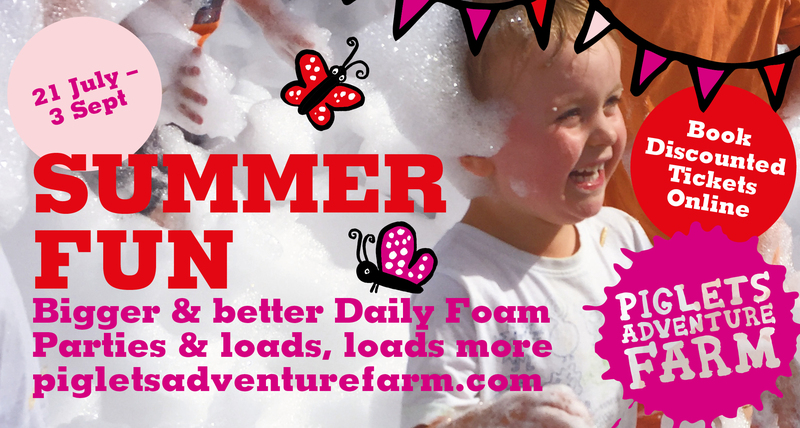 You can have a boogie with bigger and better foam parties, explore the maize maze challenge, watch hilarious pig racing and follow the magical fairy tale trail. There is also entertainment with Fatt Matt’s Circus and The Magic Hatter’s summertime silliness. 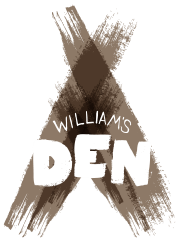 There’s stacks of indoor and outdoor fun and lots of adorable animal activities too. Rotunda Museum have a great new exhibition, Ancient Seas of the Yorkshire Coast. The Rotunda Museum is full of fascinating objects, from fossils found on East Yorkshire’s Dinosaur Coast to Gristhorpe Man, the skeleton and coffin of a Bronze Age man, which is the best example of a tree burial in Britain. FREE with an Annual Pass (costs £3) & U18s go FREE. Scarborough Art Gallery has some lovely events throughout the summer where adults and kids can get involved. Great for a rainy day! FREE with an Annual Pass & U18s go FREE. 7th & 25th July and 1st, 8th, 15th, 22nd & 29th August: Facepainting. £1.50 per child. 27th August: Beach Part – including BBQ, face painting, disco and fancy dress. While you’re at Hornsea Freeport why not pop into Bugtopia, another great family attraction at the shopping outlet. 4. The Deep – Slime Time! 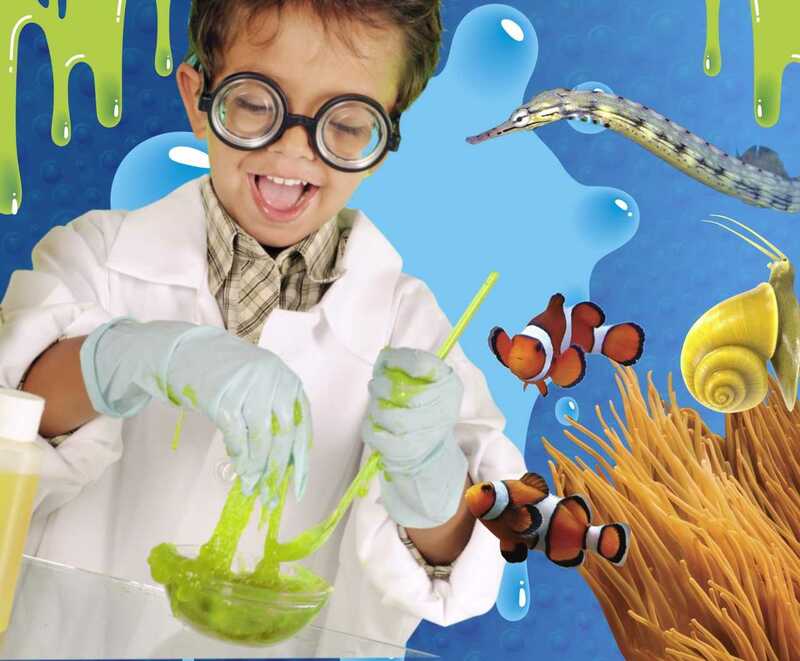 It’s all about slime this summer at The Deep! There will be a daily ‘Slime Show’ where little scientists can help with exciting experiments and explore which animals use slime in their everyday lives. There will be props galore, and of course, lots of gooey green stuff. And if that’s not enough, you can even make your own pot of slime (12-4pm) to take home for just £1. Running 21st July – 2nd September. Tower Street, Hull, HU1 4DP (Sat Nav HU9 1TU). Create memorable experiences this summer holiday (21 July – 2 September) with the whole family! Take a trip behind a steam engine, visit five heritage stations, see stunning views of the North York Moors National Park and explore the Yorkshire Seaside Town of Whitby! 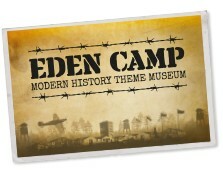 ‘Experience the sights sounds and smells of life on the Home front and the Front Line, all set in the original buildings and grounds of a prisoner of war camp. A great value, day out for all the family. Quizzes running throughout the year and junior assault course (weather permitting). Dog friendly. A great venue for a visit in wet weather as our displays are mainly indoors. Looking for a day out for all the family? We’ve been busy building fun play areas for all ages. Try out our NEW Giant Sand Pit and get your feet wet in our NEW Mud Kitchen. Test your balance on our Timber Trail play area and NEW Toddler Timber Trail. Take a ride on the Miniature Railway (additional charge applies). Challenge your friends and family to a game of our NEW Mini Football Golf. Tackle our Living Willow Maze and find the Giant Games hidden throughout it including NEW Accessible Games Stations. Complete the Quiz, which changes through the year. All set in our relaxing 12 acre site, enjoy the Lavender Fields, Wildflower and Woodland Walks and find out how we extract our 100% pure lavender essential oil on site in our wood fired Distillery. Discover a variety of wildlife and see the honey bees at work in our Giant Bee Hive. Enjoy savoury and sweet treats, including delicious ice cream, served by our friendly staff in our Tea Room or bring a picnic. Find our lavender products, plants and other treats for sale in our Gift Shop. Visit twice this year and get your 3rd visit free! Sewerby put on lots of extra activities and events in school holidays. Standard admission charges apply unless otherwise stated:Yorkshire day: 1st August, 11am-3pm. A celebration of all things Yorkshire including music, Morris dancing, flag making, fun and games and go on a Rusticus Adventure – Great Yorkshire Moments. Donkey rides (£2). Food Festival: 12th August, 11am-4pm. Cookery demonstrations plus a range of organisations, a Rusticus Adventure, swing boats, music and fruit kebab workshops in the zoo. Donkey rides (£2). Summer Family Fun Day: 19th August, 11am – 4pm. Fun and games including giant inflatables, Punch & Judy, face painting, Bougie Bounce fitness, car rallies and music. Donkey rides (£2). EYTCC Summer Gathering: 26th August, 11am-4pm. A gathering of various vehicle clubs, visitors can view many historic and classic vehicles. Also a craft fair and music. Rusticus Encounter – Greek Storyteller: Every Monday from 23rd July to 27th August at 11.30am, 1pm and 2.30pm. Exciting outdoor performance with activities. Rusticus Storytime – Robin Hood: Every Tuesday from 24th July to 28th August at 11.30am, 12.30pm, 1.30pm and 2.30pm. Choose sides as the woodland creatures create a performance from their trunk of epic adventure stories. Magic Day: Every Wednesday between 25th July and 29th August, 11am-4pm. Balloon modelling and face painting. Interactive magic show at 12.30pm, Donkey rides (£2). Rusticus Adventure – Shipwreck: Every Thursday between 26th July and 30th August at 11.30am, 1pm and 2.30pm. Energetic adventure walks with games and activities inspired by Shakespeare’s The Tempest. Sport, Play & Arts Activities: Every Friday from 27th July to 31st August, 11am-3pm. Fun and educational activities. Sewerby Hall and Gardens, Church Lane, Sewerby, YO15 1EA. As well as the maze (Jurassic themed for 2018!) there are over 20 rides attractions and shows for all ages, including a large sand and water adventure playground, three exhilarating tube slides, birds of prey centre and the House of Cornfusion where rooms magically begin to shrink, fall over, and even turn upside down! You can also watch the amazing racing pigs, get a soaking in “Angry Crows”, take the tractor and trailer ride to experience Crowmania or watch the new Crowbot 5000 show. For lots more ideas for the Summer Holidays see our full What’s on Guide here or visit our Days Out page. Why don’t you join our Ryedale & The Coast Mumbler chat group where you can share reviews of days out/activities and get ideas from others.